THE MAIN BAG HAS A DRAW STRING TO SECURE THE CONTENTS. Tehuana Huipil Frida Kahlo Style Black Velvet multicolor Floral Embroidery NWOt. Shipped with USPS Priority Mail. LIGHT WEIGHT MADE FROM 100% ACRYLIC. Each poncho have their own unique design. This is a Win Win scenario. THE ORIGINAL MOCHILA WAYUU IS REPOSITORY OF CULTURAL AND CREATIVITY ROOTED IN THE WAYUU HISTORY AND EXPERIENCE. CLOSES WITH DRAWSTRING. 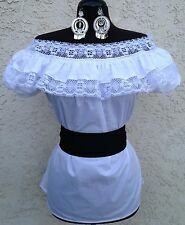 Lovely vintage embroidered Mexican dress. No issues. Lace neckline. See all pics. Hand made. Approx M/L Measured flat: Pit to pit 20" approx Length 47" 11" Slit on either side Smoke/pet free storage. This top is a great example of contemporary fashion trends such as; Frida Kahlo Style, Hippie, Boheimian, Peasant, Fiesta, Cowgirl, Santa Fe Style, Boho Chic blouse. You will love this top! They are highly skilled embroiderers as well as really lovely people! Moño charro bordado. muy bonito. 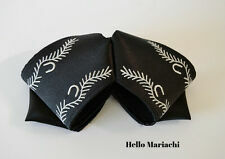 YELLOW AND BROWN MARIACHI CHARRO BOWTIE. Beautiful Poncho with warm collar. Vibrant colors. Front zip. Open A line cut for comfort. It is therefore sold AS IS. No major issues. Hem shows dirt from the dress sweeping on the floor and a couple minor spots. Zipper 19.5". The designs are all hand embroidered. BOHO EMBROIDERED TUNIC. This is a short dress. Dress is made with cotton /poly blend. Serape / Saltillo Style. Red with Multi-Colored Stripes. (Each on has Red as main color and Multi-colored stripes may vary.). Beautiful Hand embroidery dress huipil from oaxaca Mexico..It is one size but fits maximum L . Does not include belt, but if you are interested in it you can buy it too. “The [Colotenango] huipil is short, relatively wide and is worn hanging loose outside the corte. The brocade often includes small, multi-colored diamonds or squares woven in a soumak technique”. The center panel is wider and more heavily decorated. Tunic Style, Kaftan Style, Frida Kahlo! LOTS and lots of beautiful embroidered flowers, corn, tree of life in vibrant multicolors. ONE OF A KIND DRESS! Frida Kahlo's Style! Beige Color. The real color of the item may be slightly different from the pictures shown, caused by many factors, such as brightness of your monitor and light brightness. 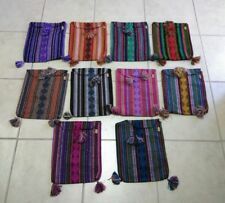 Each poncho have their own unique design. Perfect for your Cinco de mayo celebrations. Beautiful Poncho Gaban. Floral and peacock design. Black with white design. As worn, 36" across and 40" to fringe. Beautiful machine embroidered poncho. It has no arm holes. Thin fabric. 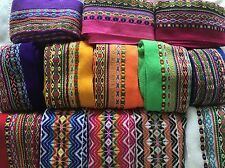 Fabric: cotton Suitable size:M Measurements: From side to side: 29" From top to bottom" 25"
Each Traditional Poncho is "one-size-fits-all". THIS PONCHO IS LIKE WEARING A BLANKET -- IT IS WIDE AND PERFECT TO KEEP YOU WARM. NOTE: You will receive the poncho of the color you picked, but the pattern may vary slightly. THE MAIN BAG HAS A DRAW STRING TO SECURE THE CONTENTS AND ALSO A FLAP THAT CLOSES WITH A SLIDE BUTTON. 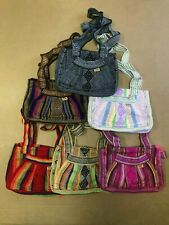 (THE ORIGINAL CROSS BODY MOCHILA WAYUU IS REPOSITORY OF CULTURAL AND CREATIVITY ROOTED IN THE WAYUU HISTORY AND EXPERIENCE. Strap may be knotted to adjust the length. ). This is a traditional huipil from the Isthmus of Tehuantepec the type so often seen on Frida Kahlo. The intricate Chullo is patterned in traditional Peruvian animal motifs. It's not stretchy, but the fibers will relax & loosen up with wear. I bought it in Peru in 1989. Knit by Hand in Peru. 100% authentic Guatemalan huipil de “Xela” bordado a mano/ Hand Woven stitched. Style/Pattern :Floral Pink, Purple, Yellow Butterfly. Fit : Regular. Colors : Multi-Color, Red. Hand embroidered blouse made out of manta. Very cool fabric. Beautiful with a pair of jeans. Size M Measurements From side to side: 22" From top to bottom : 27" Sleeves: 6" Biceps : 8 1/2"
Beautiful Hand embroidery dress huipil from oaxaca Mexico. It is one size but fits maximum L.
Vintage Hand-Woven & Embroidered Xenacoj Guatemala Huipil. A great Xenacoj huipil. Hand woven and beautifully embroidered. In very good condition. Please note a bit of fading on the front. Size is width 31 x length 18.5 inches These are great year round. In the winter I wear them over a light sweater and they are very cozy. For more great huipils and tops from around the world check out the tops section of our shop! In Guatemala, weaving is an integral part of a Maya woman’s daily life & is an important responsibility that is passed on from generation to generation. Mayans have been weaving for over 2,000 years. Beautiful & Warm ~ Winter poncho cape mañanita. ��� Ethnic Floral Design. The real color of the item may be slightly different from the pictures shown, caused by many factors, such as brightness of your monitor and light brightness. Vintage Zinacantan Men's Poncho . Mayan. Chiapas Mexico.Embroidered.